It was a great first time experience.. The Hoover Toyota staff is the most honest, reliable and knowledgeable of any place I’ve been. They take care of my vehicle and my comfort. They inform me of everything. Jonathan Dreyer is an excellent service advisor. Sheldon was fantastic! He answered every question we had and made the process of buying a new car a fun experience. My wife and I were super pleased with how welcoming and knowledgeable the entire staff was. 10/10 recommend! Great experience purchasing my first new car. The engine went out in my mustang and I needed a car asap. The team at Hoover Toyota located the exact car I wanted and had it transported to their location in under 24 hrs. When I arrived I was greeted and shown exactly where to go. When I was shown the car that had arrived shortly before I had, it was already detailed inside and out I think down to using a q-tip, good deal detail team! The tutorial of the features I was given by Mr. Randy Lyon. It was in-depth but not overwhelming, in other words excellent. He was very knowlegable and made sure you understood and had a working knowledge of the systems. After working with Mr.Lyon it was time to do the paperwork. Mr.Todd Morris greeted me and made me feel at ease. This was my first new car purchase, a lot of things to think about. Through his knowledge and perfesionalism all anxiety was gone. He explained different warranty packages and exactly the what and why of each page. He put a envelope with what I needed to take and get me my tag which was awsome customer service. I feel good about every step I took on this new experience and highly recommend the Hoover Toyota team. Now a proud owner of a 2020 Corolla SE. My car had to be towed in for a diagnosis. Peyton saw to it that our car was checked out quickly and advised the issue promptly. I was very happy with their prompt service. Peyton was friendly and helpful. Listened to my requests, performed 20,000 mile check up and addressed other requests such as wipers, reinstalling my messaging program. Worked quickly so that I was there less than an hour. Very friendly. 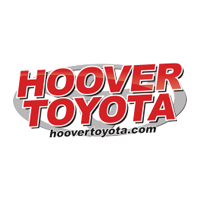 Alex at Hoover Toyota was extremely helpful, friendly and efficient in assisting us. All of the other workers were also very friendly. Highly recommend this place to the buy a vehicle! I am not one to buy new vehicles, but my experience working with Hoover Toyota made me appreciate true customer service in action. I built my vehicle and naturally there was nothing at the dealership that had everything I wanted. Hoover Toyota immediately started searching and found one in the whole Southeast that matched want I needed. Since I had a road trip planned for Easter weekend they worked their magic and had my vehicle to me four days earlier than expected. This could only have happened with the excellent teamwork from Hoover Toyota! Now I have a beautiful new 2019 RAV4 Limited, Red Flare Pearl with nutmeg interior! Love it and love Hoover Toyota. These guys rock.